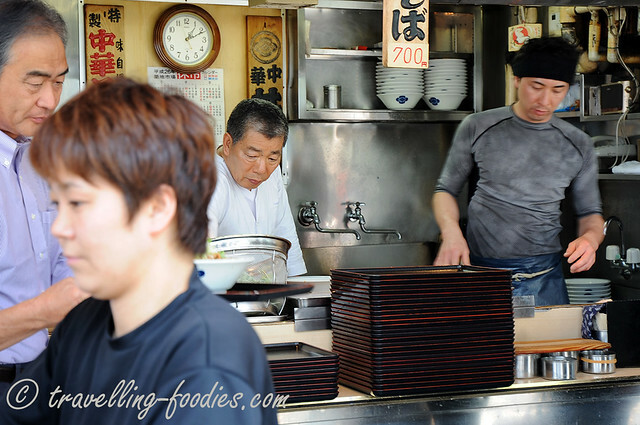 One of the places we always make it a point to visit whenever we are in Tokyo is Tsukiji Market located at the south-eastern corner of the metropolis not too far away from Ginza. 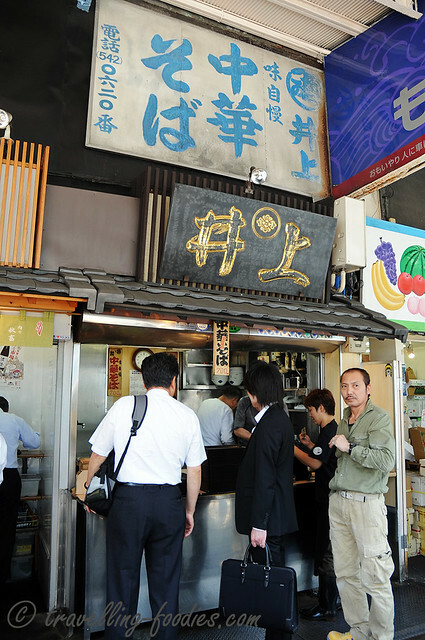 Unlike other tourist sites, Tsukiji is worth visiting over and over again from time to time. It boasts to have the freshest seafood one would be able to find anywhere and it garners the best produce from all over Japan which changes with the seasons. There is always so much to see, smell, taste and of course buy. 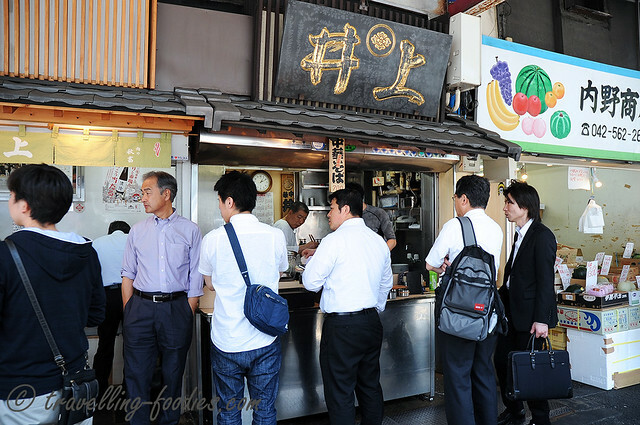 Despite our numerous trips to Tsukiji, we’d never gotten to try much of the stuff from the cooked food stalls there. Yes we’d done the “touristic thing” and ate kaisendon at some of the small sushi delis which can be found all over the place, but we’d never gotten round to try much of the other stuff there. So for our most recent trip, we’d made it a point to have a bowl the local ramen, and have a taste of what the locals eat. 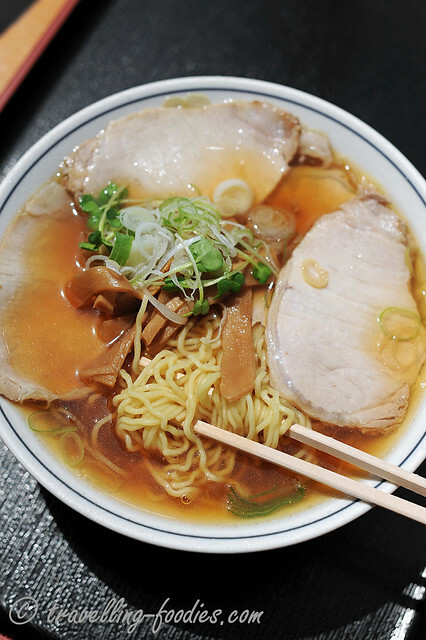 One name that comes to mind would naturally be 井上中華そば Inoue Chukka Ramen. 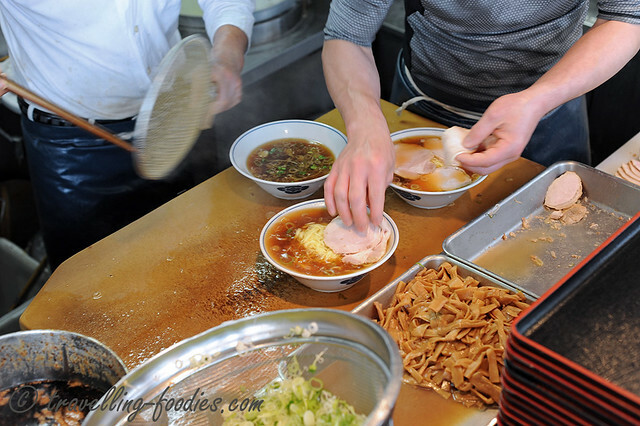 After the bowls are placed over the counter, depending on the number of orders, concentrated shoyu-based concoction was scooped into each bowl followed by a handful of chopped spring onions which was mixed with snow pea sprouts. 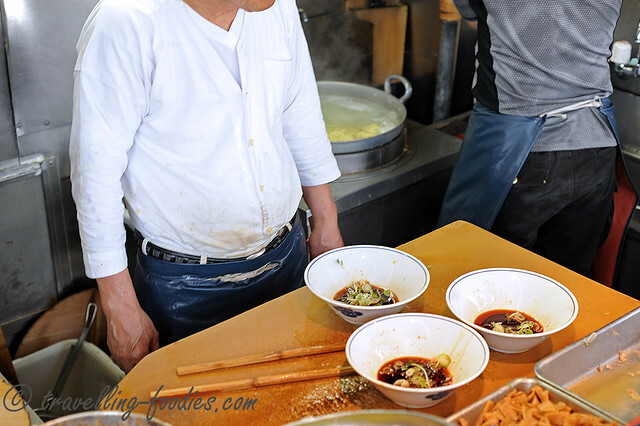 At the same time, bundles of noodles cook away in a large pot of water in a constant rolling boil nearby. 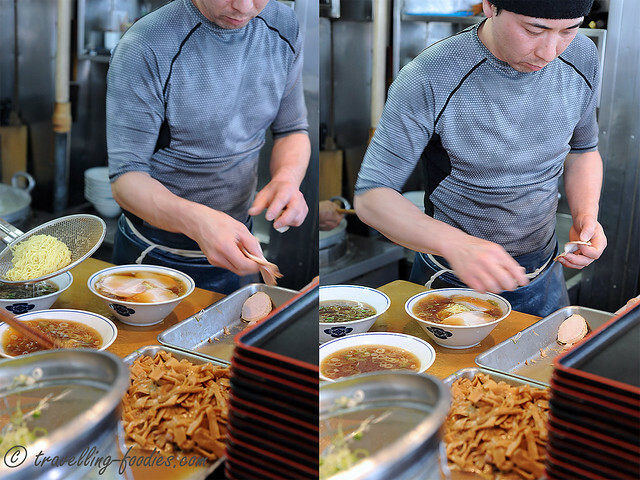 Then comes the “magic” of the ramen bowl, inconspicuously housed within the cylindrical metal dredger placed alongside the large ramen bowls in the shelves above. The elder person took down the dredger and gave each bowl a generous sprinkling. That is not salt or pepper mind you, but one of Japan’s proudest products. Known locally as “Ajinomoto”, synonymous to the company which produces it, monosodium glutamate or more commonly called “MSG” is added in an utmost unbashful manner. The fact that it could have been pre-introduced into the broth but they didn’t, showed that the folks at Inoue make no attempt to hide the fact that they used it. Then again, why the health-conscious loathe the incorporation of such additives to foods, the Japanese seemed totally at peace with it. 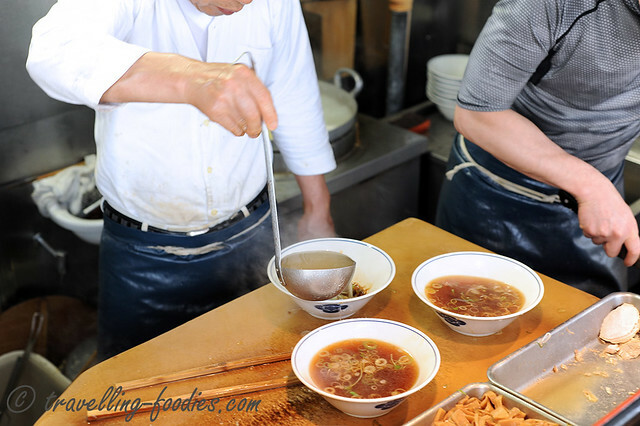 Then comes to hot shoyu-based broth to dissolve the ajinomoto, but not without a good stirring with that pair of bamboo chopsticks which had seen through countless bowls of ramen. Meanwhile, the younger guy is busy slicing up some charsiu to adorn the noodles later. Their act is concerted and highly synchronised. As always, it is amazing to watch how the Japanese chefs work, be it in roadside stalls to posh dessert parlours. I especially like how the charsiu was sliced in situ, though I’m not sure if that is always the case here at Inoue. Well, if the MSG bothers you, you’ll probably wanna give Inoue Chuka Ramen a miss. Then again, the addition of MSG in food seemed inevitable in Japan as the practice is so rampant and ingrained. With a bottle of water at hand to flush it all down, I don’t really mind the idea of standing by the walkway and slurp down a bowl of ramen as I watch the crowd go by. at 700 yen a bowl, it is a bargain which is hard to beat. Just remember, don’t drink the soup, drink lots of water and you would be fine. This entry was posted on June 7, 2014 by Alan (travellingfoodies). 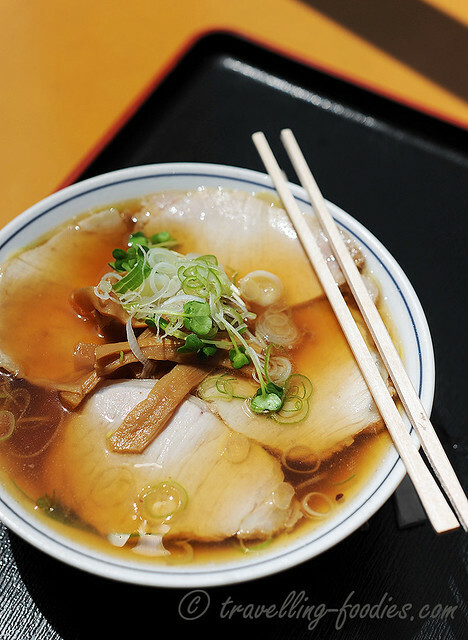 It was filed under Food, Travel and was tagged with charsiu, chukka ramen, menma, negi, shoyu, Tokyo, tsarsyu, tsukiji market, 井上. MSG isn’t as bad as it’s made out to be. It’s a natural constituent of food protein. Nice breakdown of this dynamic duo though. I love stopping by this place, and the stand down the way with the beef curry thing. Deeeericious.